Tired of having to contain your hidden urge to fart and finger-pick? Can't get enough of foul food and flies? Get ready to gross out all of your friends with these hysterically nauseating facts about all things gross and gruesome. Bringing together the slimiest, smelliest, and stickiest topics imaginable, That's Gross, is chock-full of foul facts that are guaranteed to make your stomach churn. Each chapter is packed with icky information, wacky and colourful pictures, and sickening sidebars that will make you say "That's Gross!" Hold on to your stomach while we explore the world of barf, bugs, boogers, and other things your parents won't like. 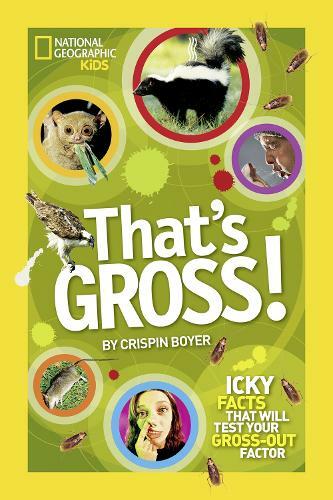 With lively and humorous prose, high-interest subjects, and truly disgusting photos, this book will have kids glued to the page while they learn the facts, history and scientific details of "eww". Kids will be so captivated by the gross-out factor that they won't even realize how much they're learning. They might even discover that these skin-crawling truths are just a part of everyday life! Other elements include the "Happy Place," featuring adorable baby animals just in case the grossness is too overwhelming; a "Gag Gauge" to rank the level of grossness of each topic; plus gross experiments, games, and more.